Swimmers need to be on time for practices and meets, and ready to swim when they get there. Coaches have been telling swimmers this ever since swim practices started. In fact, it’s so obvious its a truism. So there isn’t much that bothers a coach more than swimmers who are repeatedly late for practice for no good reason, or show up on time and then waste the first part of practice just standing around and not following the plan. I should point out that I’m not referring to swimmers who cannot make the start time, and have already arranged with the coach to start late. Or swimmers who are always on time, but something happened and they’re late once. I’m referring to those swimmers who habitually show up late, and / or display no sense in urgency in getting in the water. So why is it important to be there on time, ready to train? Coaches spend a lot of time preparing a practice so that it achieves certain goals. And in order to achieve these goals, the practice has to move forward with a certain flow. For instance, we start off with 10 minutes of dryland exercises modelled loosely on the new Japanese dryland regimen. (An excellent preparation for swimming!) Then we spend roughly 20 minutes with water warmup, technique work, and a few sprints to get the body fast. Only then can we do a good job on the main set. Scenario 1) Our tardy swimmers show up 10 minutes late, just as everybody is getting in the water. This is not only a major distraction for the rest of the swimmers who have been working hard, but the tardy ones now have only 20 minutes to do 30 minutes of work to get them ready for the main set. No matter what I decide, whether to let them skip the dryland or do the dryland, they won’t be ready. Scenario 2) Most swimmers are on deck and have started their dryland. But a few spend most of their time pretending to exercise, or just standing around, or even worse, distract others from doing their dryland. 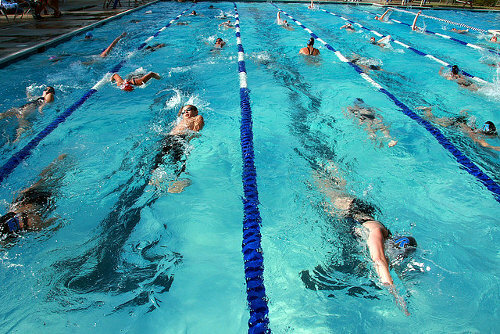 Chances are many of the swimmers are not fully ready after 10 minutes, or are resentful of the disruptions. And the coach has to spend valuable time trying to get everybody on track instead of actually coaching. Notice that in both case, we have unnecessary distractions, and unprepared swimmers. But the big problem is that when swimmers aren’t ready, they aren’t able to push themselves or their teammates to the fullest in order to reach their goals during the main set. There is a secondary effect to this issue as well. Every swimmer has off days, and it’s usually an internal discipline that allows them to still get the most out of practice. But with loose discipline, most swimmers will start to feel it’s acceptable to slip into bad habits. And so those off days can turn into less productive days. All of this means that teams have to have policies of swimmers getting to practice on time and ready to swim, or else disciplinary actions have to be taken. Most coaches really do not want to do that, but in order to properly serve the majority of the swimmers, we have no choice. So my question to you. What do you think should be done about tardy or unprepared swimmers? Previous Post Should Swim Practices be Open or Closed to Spectators? Next Post Faster, Better, Stronger Swimmers?